FTG offers busbars for NH fuse switch disconnectors in sizes 00 and 000, e.g. for use in industrial plants and the public grid. 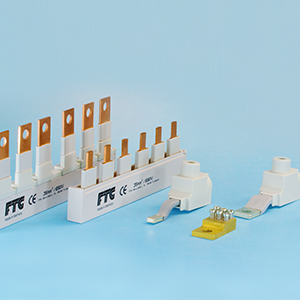 FTG’s busbars are matched to the manufacturer-specific properties of the NH disconnectors. Because of the space savings compared to traditional 60 mm system, the switch cabinet with the NH disconnector busbar is much more clearly laid out.